The Bain Mound Site (23BO4) was excavated by archaeologists from the University of Missouri at Columbia and published by Brewton Berry et al. in the Missouri Archaeologist 4(3):20-26. The fieldwork was conducted during 1936. Colorized top plan showing the vault walls (gray) and interior. Two colorized profiles showing the vault stones (in red). 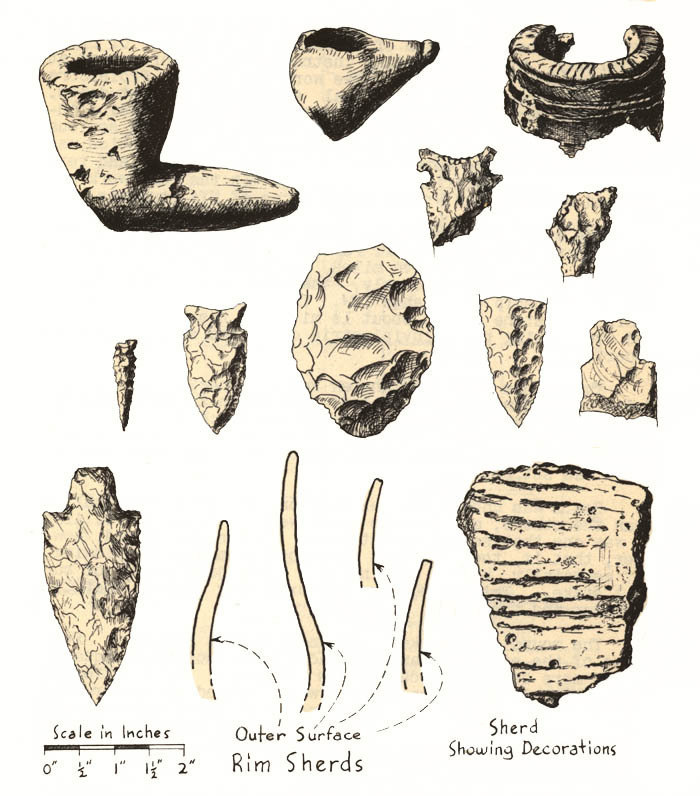 Drawings of artifacts from the Bain Mound (23BO4) published in Berry et al. (1938). The excavation recovered approximately 100 pottery sherds, two complete pipes, a portion of a third pipe, one chert scraper, three projectile points, the base of a chert awl, pieces of four other projectile points, and fragments of two bone awls. 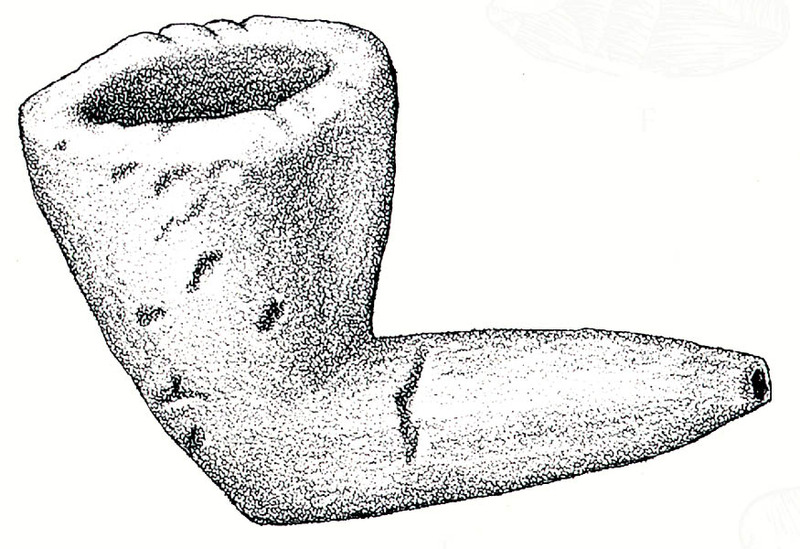 Line drawing by Eleanor Chapman of an intact clay pipe from the Bain Mound (23BO4); published by Chapman (1980: Figure 4-20J). The three pipes were made from the same clay fabric as the pottery sherds found in the mound. One pipe was decorated with deep incised lines running around the body of the bowl, and shallow lines on top of the rim. It is estimated that approximately 30 individuals had been buried in the mound. The vault contained 12 extended burials. One layer of extended burials were placed on the vault floor while a second layer was only a foot beneath the ground surface. A dozen bundle burials were discovered inside the fill of the mound; no bundle burials were found inside the vault. Digital scan of a black-and-white photograph from Bain Mound (23BO4) published by Berry et al. (1938). Southern wall of the vault. Extended burials; upper portions missing. 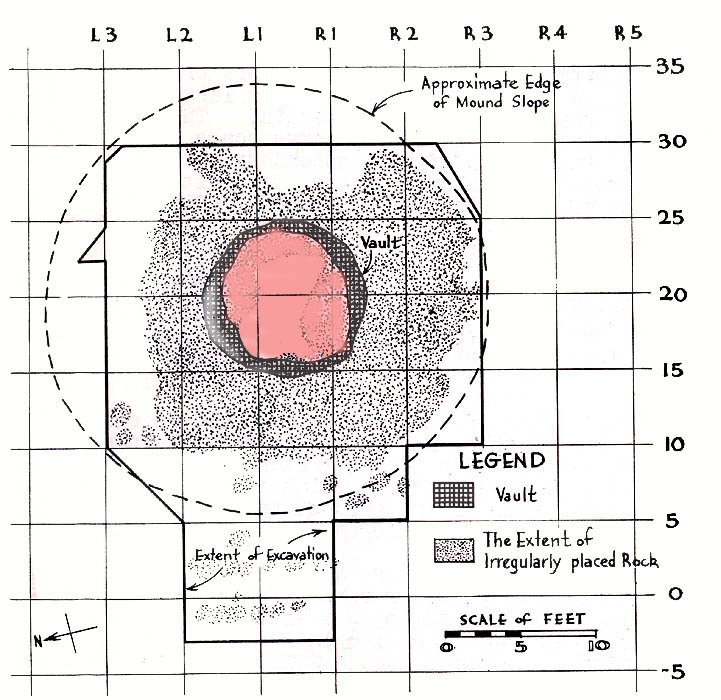 1938 Archaeological Investigations in Boone County, Missouri. Missouri Archaeologist volume 4, number 3.